Regaining his balance, Holmes began to make his way along the passageway. The ship was already listing badly to one side, and I could hear faint screaming coming from somewhere above us. Taking Mary’s arm, I followed my big-nosed companion, keeping one hand on the handrail to steady myself. “What’s the plan, Sherlock?” I said. We reached the first flight of steps to the next level and hurried upwards. Emerging into another passageway, we were pushed roughly aside as dozens of third-class passengers thudded past us, screaming and shoving each other out of the way in their haste. Two of the women were thrown to the floor, but their companions simply ran on, desperate to escape what would soon be a watery grave. “Quickly,” said Holmes, helping one of the ladies to her feet. The other female took hold of her friend’s collar and slapped her about the face. “Calm yerself, Doris, we ain’t dead yet, gal!” And with that, the pair hurried off towards the next staircase. “It’s no good,” said Holmes, pulling Mary and me to one side. “We’ll never get past the crowds in time.” He looked around helplessly. I turned to look at Mary who was pulling at a hatchway in the wall. A moment later, he had shimmied up the pipe and was gone. “Come on, darling,” I said, pushing Mary into the hole.” Women and detectives first.” She didn’t need to be told twice and a minute later I was climbing up after her. Due to the ship’s ever-steepening angle, the climb was not as arduous as I might have otherwise expected. Already we were moving diagonally upwards and the going became easier as the liner tilted slowly downwards. Above us, the wails and screams of the other passengers had grown considerably in volume and I must admit to feeling a little disappointed in my fellow man, wishing they would pull themselves together. After all, the English are renowned for our ability to keep a cool head in a crisis. My thoughts of stiff upper lips and such like were pushed aside as we scrambled out onto what I took to be the upper deck. Hauling ourselves into another passage, I was heartened to see an open doorway opposite. “Stick together,” said Holmes, latching onto my sleeve. I grabbed Mary’s hand and the three of us half slid, half walked out onto the deck, which was by now sloping downwards at such a steep angle, I doubted we’d be able to stay upright for more than a minute or two. 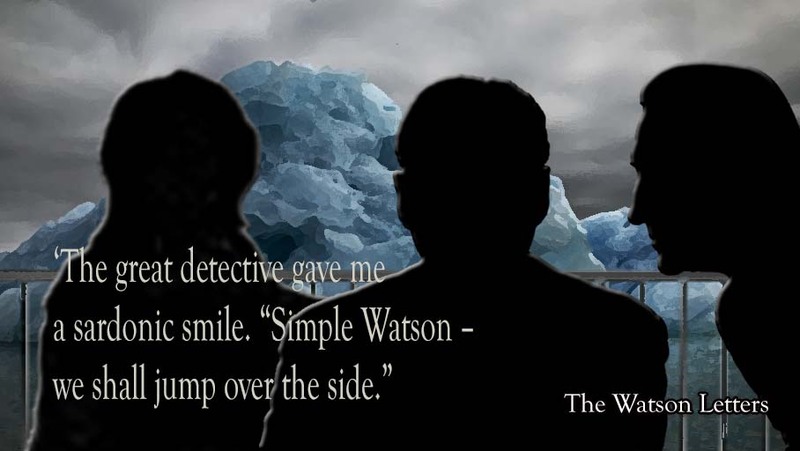 But then I saw it – beyond the railings and towering high above us, was the iceberg. “How are we going to get aboard?” I shouted to Holmes.